Thank you for installing Artensoft Tilt Shift Generator! Artensoft Tilt Shift Generator 1.1 released! Artensoft Tilt Shift Generator 1.0 released! Artensoft Tilt Shift Generator has been successfully installed on your PC. Feel free to visit our gallery featuring dozens of cool tilt-shift photography. Just click this link and enjoy the show. Try downloading and installing another great product capable of creating amazing photo collages in just a few mouse clicks! Create perfect photo collages every time! 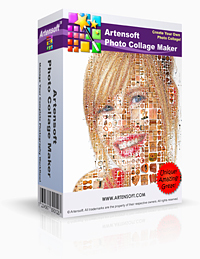 Artensoft Photo Collage Maker will bring new life into your digital photo collection by turning pictures into stunning collages. With Artensoft Photo Collage Maker, you can turn the image on the left into a perfect collage. All you need to create an impressive collage is a master image, a preferably large library of cell images, Artensoft Photo Collage Maker and a few mouse clicks. Feel free to visit our gallery featuring dozens of cool photocollages. Just click this link and enjoy the show. Quick links: tilt shift generator, photomosaic Artensoft © 2007-2019 Artensoft™. All rights reserved.